Marie-Galante Ecomuseum exists since 1976, thanks to Inventory, traditions and popular arts organisation. During this year, the organisation set up an event in the island to collect simple art items of everyday life. This is how Marie-Galante Ecomuseum became an historical place, helping visitors to understand Marie-Galante Island’s history. The Regional Council of Guadeloupe Archipelago is fully in charge of the Ecomuseum since 1979. 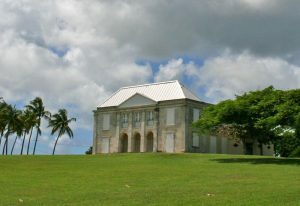 Marie-Galante Ecomuseum is an Arts and Traditions gallery featuring Marie-Galante Island sugarcane history during the colonial period. The Ecomuseum gathers crucial information such as pre-industrial technological materials, archives and recorded testimonies from multiple inhabitants in different industries. The documentation area is quite significant, covering 3 centuries and highlighting the cultural and historical heritage of Marie-Galante Island. Marie-Galante Ecomuseum is in Grand-Bourg Township and part of Habitation Murat. In fact, the Habitation is a famous sugar plantation which is still in operation. Before this, Coffee production was the main focus of the habitation. Then, during the 19th century, the Murat family purchased the property, hence the name. Since the acquisition, there is only sugarcane production. When visiting Plantation Murat you will be able to see the Master’s house, the stables, the former factory as well as the windmill. As mentioned earlier, the Regional Council of Guadeloupe Archipelago is fully responsible for restoring and protecting the habitation. In 1990, it became a historical monument. Outside the Ecomuseum, there is an interesting medicinal garden with a wide range of healing plants. There are plants for digestive issues, to increase energy but also plants for baths and all kind of pains. From the garden you will have a stunning view of the lagoon and Dominica Island. Marie-Galante Ecomuseum is a place not to be missed when visiting Marie-Galante Island. Especially because sugarcane is an integral part of Marie-Galante Island landscape and history. Don’t forget to request a tour guide if needed, it is always much more beneficial to get some help when discovering historical places.